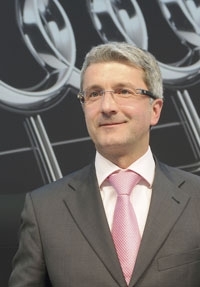 "We are successfully performing against the European trend," Audi CEO Rupert Stadler says. "We expect Audi to perform well 2013." BERLIN (Bloomberg) -- Audi AG, the world's second-largest maker of luxury cars, said it's on track to reach a goal of selling a record 1.4 million vehicles in 2012 and expects the momentum to continue into next year. "We are successfully performing against the European trend," CEO Rupert Stadler told journalists Tuesday at the manufacturer's headquarters in Ingolstadt, Germany. "We expect Audi to perform well 2013." Luxury automakers such as market leader BMW AG and Audi have used price cuts to maintain sales and counter a market slowdown, hurting profitability. Nine-month operating profit at Audi, a unit of Volkswagen AG, narrowed to 11.1 percent of sales from 12.1 percent a year earlier, while deliveries jumped 8.8 percent. Audi plans to start building a factory in San Jose Chiapa, Mexico, in 2013 as it follows the strategy of German competitors BMW and Daimler AG's Mercedes-Benz unit in adding production outside their home market. Until three years ago, Audi produced 75 percent of its vehicles in the German cities of Ingolstadt and Neckarsulm, focusing largely on increasing quality and expanding its model lineup to include the A1 subcompact, A7 four-door luxury coupe and Q5 SUV. Growth was supported by using spare capacity at a former VW facility in Belgium and a factory owned by Volkswagen's Spanish brand SEAT. BMW and Mercedes, in contrast, have long-established factories in South Africa, the U.S. and China. By 2017, the share of Audi's domestic manufacturing is projected to fall to 45 percent while annual production doubles to 1.9 million vehicles, largely at new sites in China and Mexico and an expanded facility in Hungary. The San Jose Chiapa plant, scheduled to begin operating in 2016, will have capacity to make 150,000 vehicles a year. It will be located about 60 kilometers (37 miles) east of Puebla, Mexico, where Volkswagen builds the Jetta and Beetle cars for North American buyers. The Audi site will manufacture the Q5. The site can be expanded to produce other Audi SUVs, Stadler said, adding that there currently are no concrete plans to do so. Audi sells about half as many cars in the United States as BMW and Mercedes, and it has a target of increasing deliveries in the country by 59 percent from last year to 200,000 vehicles by 2018. Audi's global 10-month car and SUV sales rose 13 percent to 1.2 million vehicles. That compares with with an 11 percent increase at VW's namesake brand to 4.72 million units. A 900 million-euro ($1.14 billion) expansion of Audi's plant in Gyor, Hungary, will triple annual capacity to 125,000 cars as of 2013. Next year will also mark the start of production of a variant of Audi's A3 compact at a new factory in Foshan, China, part of VW's joint venture with China FAW Group Corp. The plant, Audi's second in the country, will boost Audi's annual capacity there by 40 percent to 700,000 vehicles.